In recognition of this honor, the Arts Commission will present a free concert on June 2 at Cabrillo College’s Samper Hall featuring Phillips and friends, including the Teen Celtic Band and Harp Orchestra, the Ukulele Club of Santa Cruz, and UC Santa Cruz music professor Linda Burman-Hall (a previous Artist of the Year winner in 1994). The Santa Cruz County Artist of the Year is awarded to artists who live within Santa Cruz County and who have developed a national or international reputation. In addition to Burman-Hall, previous UC Santa Cruz winners include dancer/choreographer Tandy Beal, poet Gary Young, and novelist Laurie R. King. A multi-instrumentalist who performs on harp, flute, oboe and English horn, Phillips, and her cellist husband Barry, have played and recorded with a wide variety of folk musicians in America, Ireland, and the UK. 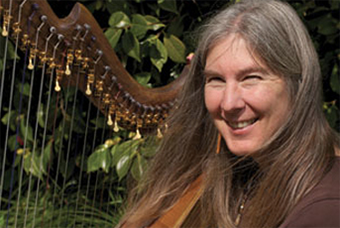 Phillips is also director of the Santa Cruz Community Music School, where she runs Celtic music camps for children and teens, maintains a private studio, and presents concerts and workshops with visiting musicians. She earned a degree in music from UC Santa Cruz in 1985 and received her master’s in music from the San Francisco Conservatory of Music. Phillips plays for the Episcopal church, makes bamboo flutes with the English Piper’s Guild, teaches flute making, and directs the Santa Cruz Shape Note Society. She has been a member of the Coulter/Phillips Ensemble and the Anjali Quartet, and has toured the world. Her solo albums on Santa Cruz’s Gourd label include The Fairie Round, Pavane, and The Butterfly. She has recorded music of the Shakers and produced a benefit album, Verdant Groves, for the Shaker village museums. Phillips also collaborated with Rumi translator and poet Coleman Barks for two CDs, What Was Said to the Rose and Five Things to Say.